Unlike older children and adults, young babies do not require a bath every day. 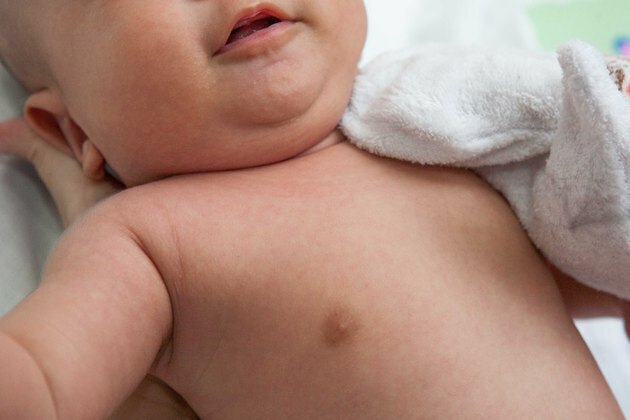 Bathing your baby more than three times a week during the first year of life may dry her skin, according to the American Academy of Pediatrics. Between baths, you should clean your baby's face and diaper area each day to keep the skin healthy. If your baby has a skin condition, such as infant acne, your doctor may recommend that you wash her face more often. Wet a soft washcloth or two clean cotton balls with warm water. Gently wipe your baby's eyes from the inside corner, near his nose, to the outside corner. 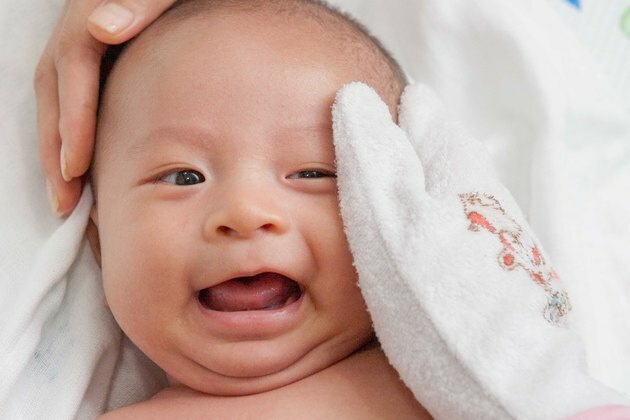 Wash the rest of your baby's face with a warm, wet washcloth. Avoid using soap unless your doctor has recommended it to treat infant acne or another skin condition. Wipe her forehead, nose, cheeks and chin gently. Do not scrub your baby's delicate skin. If she has dried matter around her eyes, nose or mouth, pat the area with the washcloth to soften it, and then gently wipe it away. Wash behind your baby's ears and clean the outer portions of the ears with the washcloth. 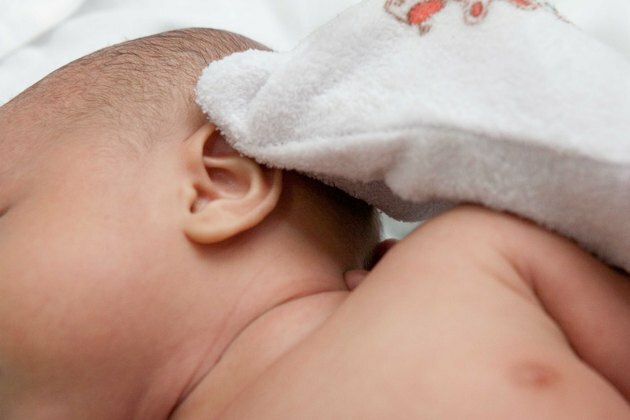 Never put your finger, a cotton swab or anything else into your baby's ear canal to remove earwax; this could cause an earwax blockage or damage your baby's eardrum. Simply wipe the external portion of his ear to remove earwax as needed when you wash his face. Lift up your baby's chin gently and wash her neck. This area often gets dirty when babies drool, spit and eat, and the folds of skin can become irritated if not washed regularly. When you give your baby a bath, wash his face first before the washcloth comes in contact with dirtier areas of his body. Make sure the washcloth and cotton balls are not too hot before you put them on your baby's face. Squeeze a few drops of water on the inside of your wrist to check the temperature. When you bathe your baby, never leave her unattended for any amount of time in any amount of water, and never take your hands off the baby during a bath.